There’s no denying that winter is on its way here. Fortunately, the first frost has been late, and I was able to scatter crocus bulbs around in our front and back gardens, late last month. This is our first fall in a house and it’s been exciting for us to go through all the rituals of the seasons in our first real family home. I’ve never planted bulbs before, but there’s something about this fall ritual that feels wildly optimistic. As the leaves tumble around you, and the garden falls into its long, slow, autumn decay, you are already thinking of spring, picturing these brave little stems poking through the last of the winter snow. I was so inspired by the thought of these brave little purple flowers, that I cast on Wendy Johnson’s crocus socks from Toe-up Socks for Everybody to take my mind of the grey November weather. I knit them in a very spring-y green Cascade Yarns Heritage Silk. I’m not usually a fan of colours this solid, but the pattern and yarn were a perfect fit. The silky yarn is a slippery pleasure to knit, I just hope they stand up to frequent wear. The yarn can allegedly be machine washed and tumble dried, but our hand knit socks get washed in Soak and line dried. The lace pattern here got a little tedious, it was the first pattern I’ve ever knit where I couldn’t memorize the chart, but I think the end result was worth it. The lace is beautiful and intricate, and like most lace patterns, it’s not difficult; the chart simply has the be tackled line by line. I’ll be approaching the grey weather in the same way, day by day, until those crocuses come up. This entry was posted in Knitting, Socks and tagged crocus, fall, garden, knit, socks, Wendy Johnson on November 14, 2013 by lisagono. 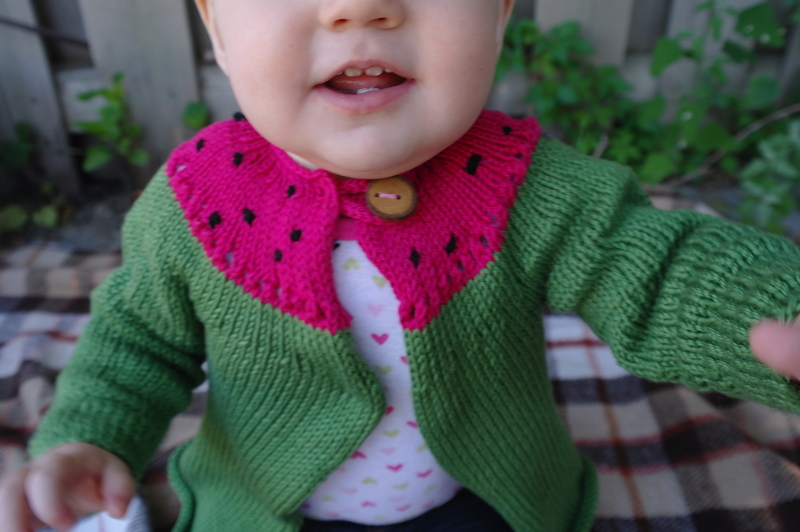 My niece in the second Watermelon sweater (size 12 months) – look at those teeth! I was completely charmed when I first spotted this pattern. So much so that I briefly considered making four, for my youngest nieces. 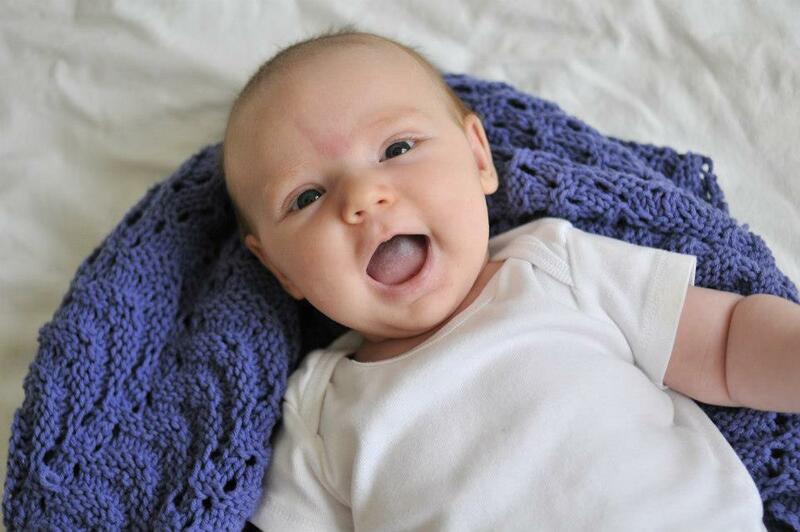 Fortunately, I realized even the best pattern gets tedious, and scaled back my plans to just two baby cardigans, one for each of my infant nieces. I wish I had a picture of the cherubic little cousins together their cardigans, but the second wasn’t finished in time for a family get together this weekend. That would have been the best way to do the sweaters justice. 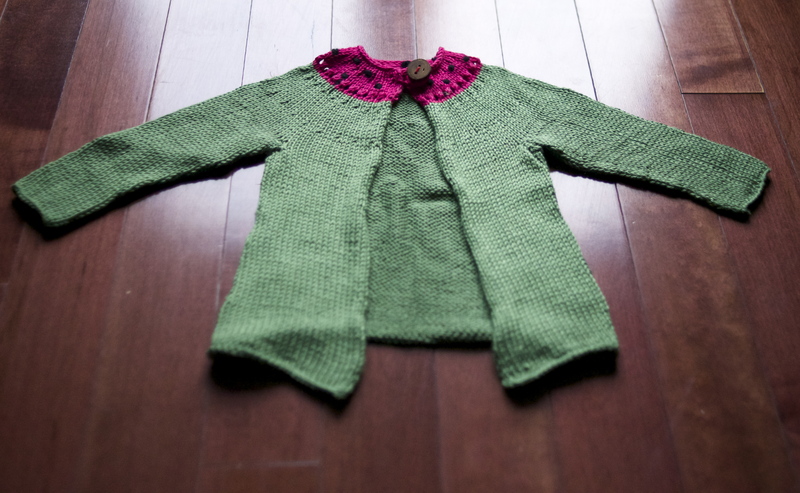 The second cardigan has one small modification, but otherwise followed the pattern exactly. I thought the pink section was a little small on my first sweater, so the top sweater has an extra 5 rows of pink (with the eyelet row occuring 5 rows early too). I think it changes the impression quite a bit; on the original (below) the pink seems like a collar detail or embellishment, but on the second it looks more like a wedge of watermelon across the yoke. The end results, like any well-written infant patterns, are adorable, but I think these sweaters proved to be a little less than the sum of their parts. The pattern is written for Manos Cotton Stria, which has been discontinued, so I had to find a different yarn. 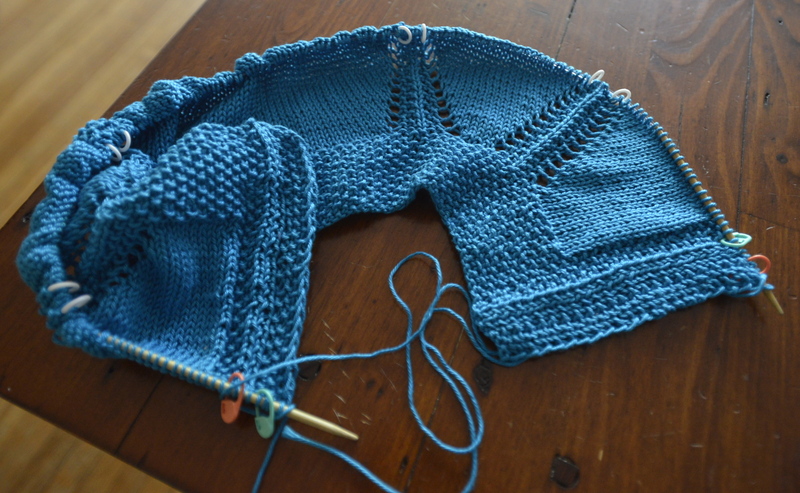 I quickly settled on Cascade Ultra Pima, which worked perfectly for my cap sleeve lattice top. It’s soft, washable cotton and comes in a wide variety of colours. While both the yarn and the pattern are fabulous on their own, I’m not sure they’re a great pair – the pink is a little too saturated to convey watermelon, and the sweaters are just a little floppier than I’d like. However, despite any small disatisfactions, I do think their owners make these sweaters pretty cute! 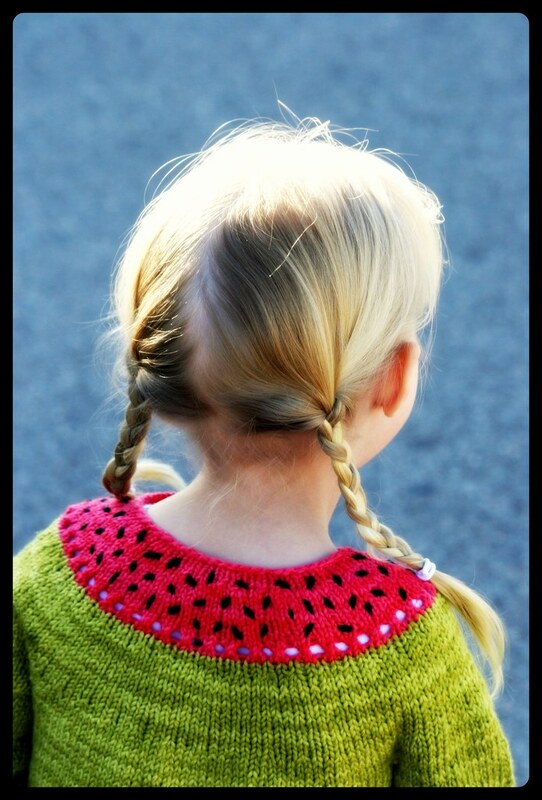 This entry was posted in Baby knits, Knitting, Sweaters and tagged baby, cardigan, Cascade Ultra Pima, knit, sweater, watermelon cardigan on July 25, 2013 by lisagono. Favourite classic: Elizabeth Zimmerman’s Knitter’s Almanac. There is a reason that Zimmerman’s name is synonymous with knitting for many people. This book is full of fantastic patterns (mitered mittens and baby sweater on two needles are two of my all time favourite patterns!). But what seperated the Almanac from her other titles is that it’s a great read on its own. Zimmerman shares her thoughts and life as a knitter. Her directions are by her own admission “pithy,” but for me that just highlights the history of knitting as something shared (often orally) through families and amongst a community. A must read for any enthusiastic knitters. Toe-Up was one of the first books I bought. It is a fantastic beginners book – she explains every necessary technique clearly and concisely, and there are enough variations to keep any knitter busy for years. I still return to this book when I want something to knit in the car or while travelling (the type of project you can knit without consulting the pattern very frequently.) I have knit nine of the 23 patterns in this book, several of them many times, and I keep coming back. When I started to outgrow Toe-Up, I began looking around for a more challenging toe-up book, since by that point I was convinced that toe-up was the only way to do it. When the owner of my LYS suggested knit.sock.love, I was skeptical, since all the patterns are cuffdown. However, one look at this beautiful book changed my mind. Gorgeous enough to be a coffee table book, knit.sock.love is a book that inspires ardent admiration. There are regular knit-alongs for this book on ravelry, and a surprising number of people have conquered all 19 patterns, including the cabled knee highs (there are 2!) and intricate diagonals. I see knitting through this book in the way that many view reading all of War & Peace (which I have done!) or running the Boston Marathon (which my knees will never agree to!). It’s a big project requiring patience, perserverance and time (hopefully one day I’ll have enough of all three). I have made my way through Hedera, Wedge, Monkey, and Mona, and they are so beautiful; it’s no surprise that so many people love this book. Favourite beginner book: Betty Christiansen’s Knitting for Peace. This was actually my first knitting book, and it’s one I highly reccommend for beginners ready to branch out from their first hats, scarves and mitts. The book contains great, simple projects for blankets, shawls, hats, toys, sweaters and socks. The basic patterns don’t require special or expensive yarn to look good, so it’s also great if you’re still at the stage where you’re reluctant to drop significant money on yarn, or your hometown doesn’t offer more than the selection at Michael’s and Wal-Mart. It’s full of information on how to use your knitting to make the world a better place. Inspirational, simple, useful. Narragansett sweater by Thea Coleman. I can’t wait to make this! Favourite imaginary book: Thea Coleman’s Baby Cocktails. Ok, this one doesn’t exist (yet? ), but it should, my ravelry queue is filled with her patterns, and Vodka Lemonade is on my needles now. Her directions are clear, concise and accurate. Each design shows a clear attention to how they will fit on a woman’s body, and each pattern has a wider variety of sizes than you are likely to find at the mall (I’m guessing sizes 0-20). I love that her patterns are simple and plain enough to be wearable and fashionable. Each one has simple embellishments or details that make it special and different, without making it fussy or dowdy. Somebody in publishing please offer this woman a book deal! 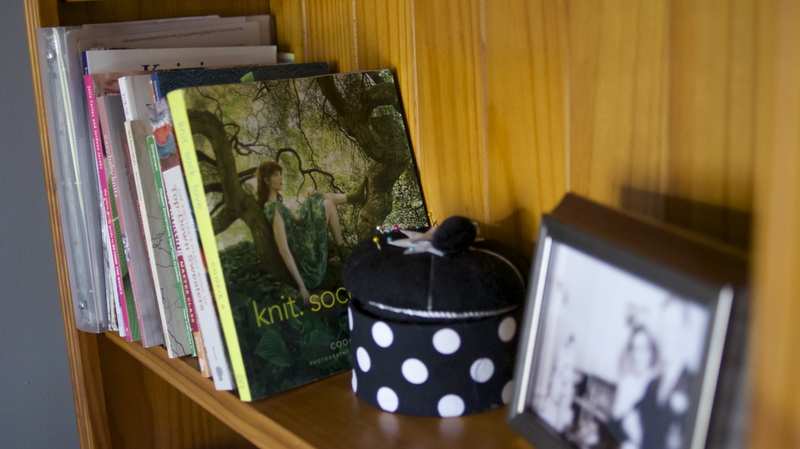 I’d love to know what books you think are missing from my shelf – What are your must-own pattern books? This entry was posted in Knitting, Retro patterns, Socks, Sweaters and tagged Cookie A, Elizabeth Zimmerman, favourites, knit, knit. sock. love., knitting, knitting books, socks, sweater, Thea Coleman, Wendy Johnson on July 18, 2013 by lisagono. In lieu of sharing any actual projects, I thought I’d share my summer project queue; a round-up of the knitting I wish I was doing, if you will. 2. Vodka Lemonade Cardigan by Baby Cocktails. 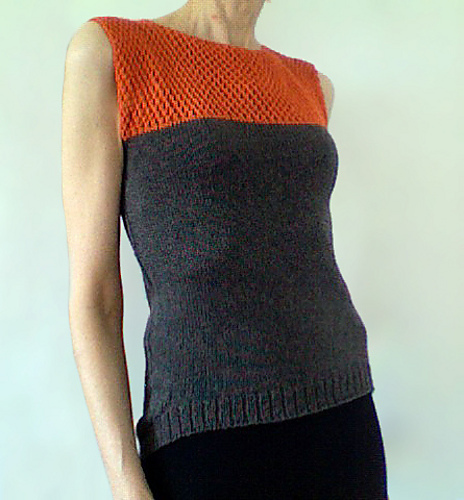 Like my cap sleeve top, I have cast this one on (also in Cascade Ultra Pima). I think it’s a perfect summer knit, since the DK cotton is a nice weight and fiber for wearing over summer dresses, on cool evenings – if only, I finish it before the evenings get absolutely cold. I’ve set aside some time to go to a yoga retreat next month, and I’m already imagining wrapping this around me, by the lake. 3. Watermelon by Alana Dakos. I’ve bought the pattern and enough pink and green yarn to make a pair of these for my adorable new nieces (six and three months old!). I can’t wait to see pictures of them rolling around in matching cardigans…. so clever and adorable. 4. Plain host/hostess gift socks. 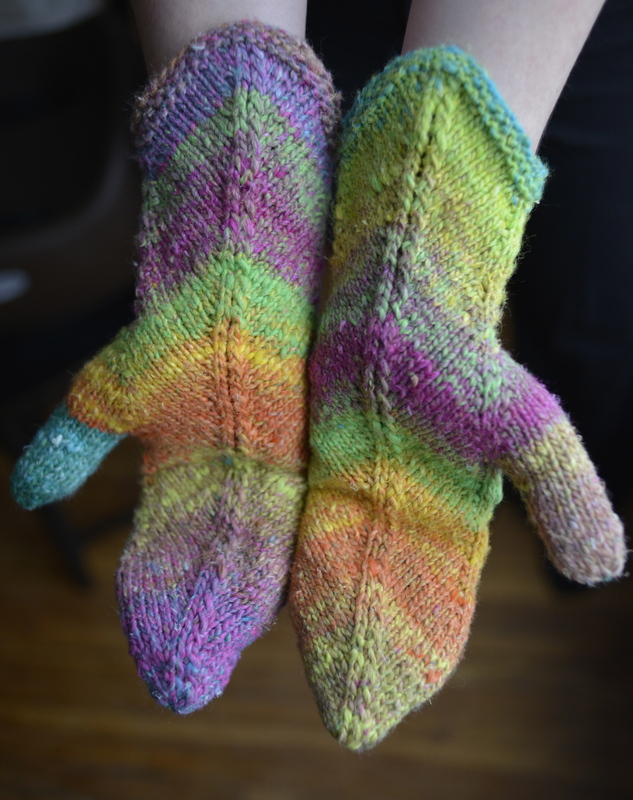 I’ve completed one pair, but want to cast on another in Tough Love Sock, this time in Stormchaser. I think these socks will make the perfect gift for my sister and brother-in-law, who will be hosting us in New York, late in the summer. It’s hard to come up with a thoughtful gift for hosts who have everything, especially if you’re flying carry-on. But, I think everyone can use another pair of socks, and the fact that they’re homemade tells your host how much you appreciate it! Stonecutter sweater, from Interweave Knits. This entry was posted in Knitting, Socks, Sweaters and tagged knit, Purl Soho, ravelry queue, socks, Summer knitting, sweater on June 27, 2013 by lisagono. 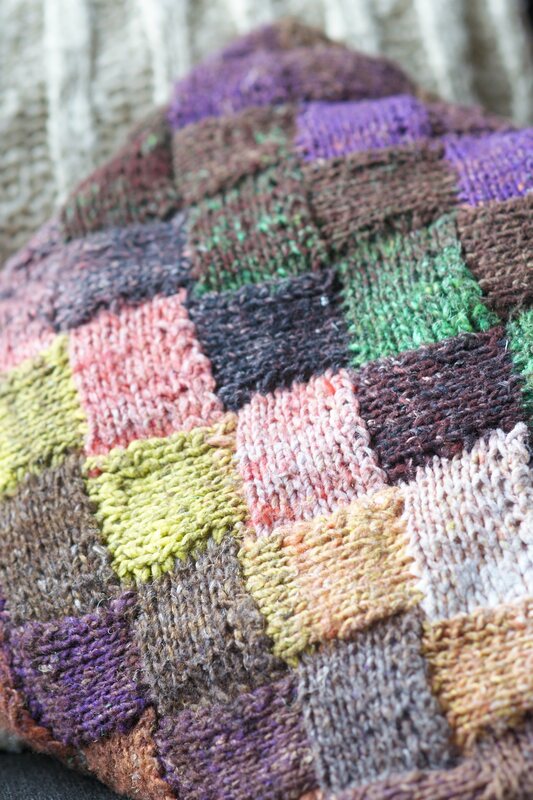 Entrelac is a knitting technique that creates a fabric that appears to be woven. In reality it’s made by knitting in a series of tiers, each constructed out of parallelograms joined to their neighbours. The beauty of entrelac is that it requires a relatively small number of basic knitting skills to execute. If you can knit, purl, k2tog, ssk, p2tog, kfb and pick up stitches you can entrelac. Entrelac is very challenging to design with (the long repeats make for challenging shaping), but reasonably simple to execute. My internet research, couldn’t unearth the origins of this technique, but it became popular in the late eighties. Originally, most entrelac patterns called for you to change colours each tier (like I did in the accompanying photo tutorial). However, I favour the even easier way to achieve all those colours: a self striping yarn, with long sections of colour, like Noro. It isn’t only easier, it achieves a more organic effect, with colours blending into each other, rather than changing abruptly. There are lots of entrelac patterns on raverly, including these socks, from Sock Knitting Master Class, and while I greatly admire the mastery and creativity, I’m not surprised that it’s the least popular pattern in the book (with only 5 projects on ravelry). Some may be intimidated by how complicated they look (but really – entrelac is easy!) and not everyone will want to wear something this wacky. my favourite entrelac project is the cushion, pictured at the top. It’s a perfect beginner project: just buy or make a cushion, then knit a long rectangle in entrelac that is the width of the cushion, and double it’s lenghth. When you are done, fold over the cushion and seam the three edges. It makes a beautiful quick, gift (and one I’ve given three times!) Another entrelac favourite?This surprising discovery! How beautiful is that wedding shrug by Alex Lawson? It makes me wish I knew a knitwear loving bride to make it for! So how do you do it? 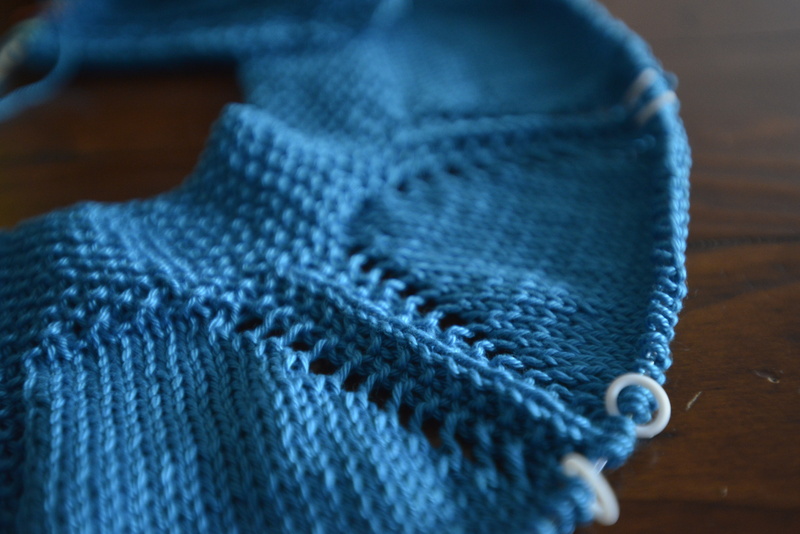 I like to slip at the beginning of each knit row, to give myself a looser edge to pick up into. 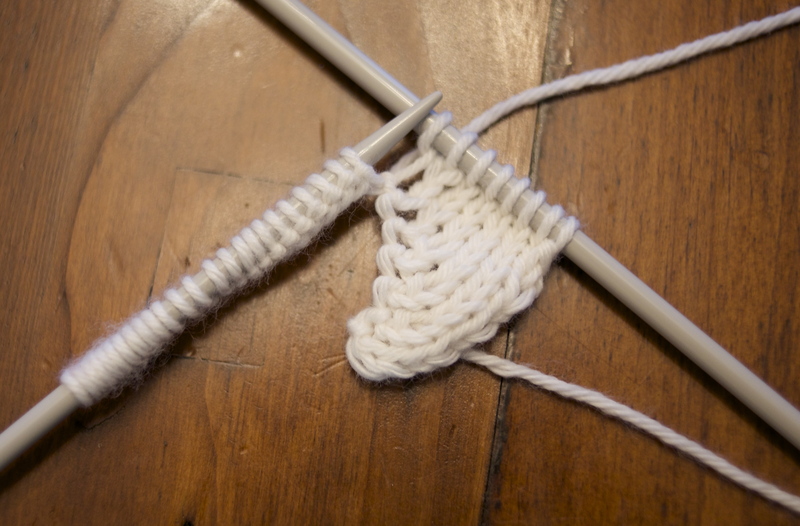 Now move on to the next triangle, by leaving the completed triangle on your right hand needle and knitting 2 more and turning (your now back at #2). Repeat steps 2 to 13 to create the second triangle (and so on). 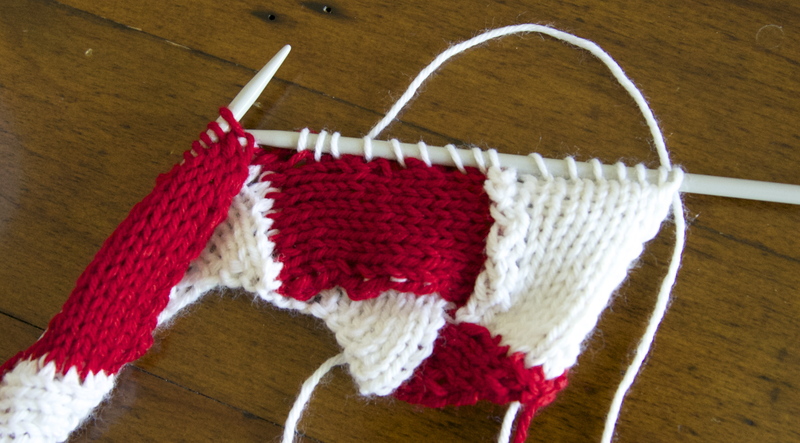 After creating 4 triangles, I switched to red yarn and moved on to the first tier (this one made of parallelograms). Because my piece is flat this tier will include triangles at the beginning and the end of the tier to provide flat edges. I changed to red for the first tier, and my instructions will now identify stitches from this tier as “red”. Repeat these two steps 7 more times. It should look like the white stiches of the next triangle are disappearing under this red parallelogram. 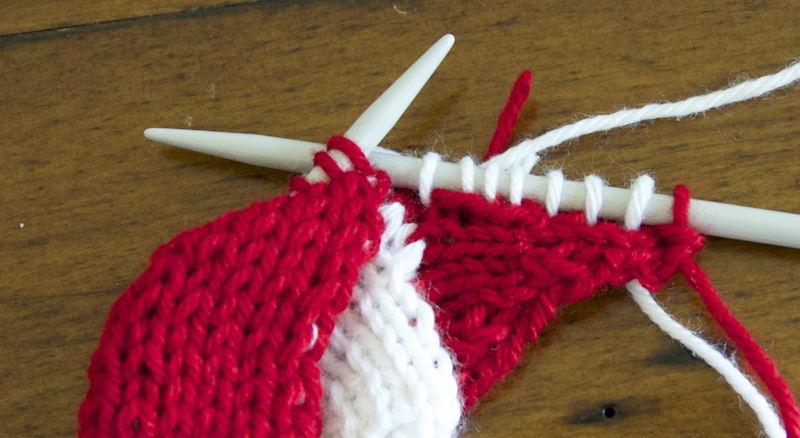 You should also be creating a gap between the first set of 8 red stitches, and the second set of 8 red stitches. However, the first tier is not yet complete. 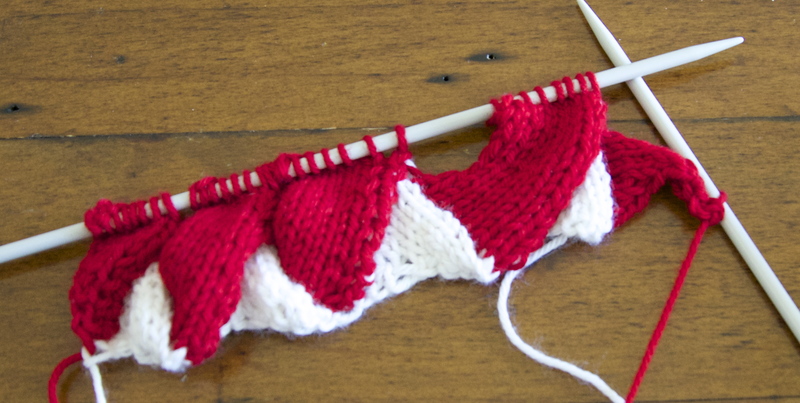 You have replace all of your white base triangle stitches, with red tier one stitches, but another triangle is required to give the right side of this a flat edge. To create the final side triangle, pick up 8 stiches (with the wrong side facing you) and turn. Showing the 7 picked up stitches. You know have 8 stitches on your right needle. 1 red from the last tier and 7 white that you just picked up. Now you are finished the first tier, you should have 33 red stitches. 32 on the left needle, and 1 lonely one from the final triangle on your right. To create the second tier, I changed back to white. Second tier stitches will be referred to as white stitches in this section. To begin the first parallelogram of this tier pick up 7 stitches, with the right side of the work facing you. You will only pick up 7, because you already had one stitch on your right needle. Turn your work. A completed tier 2. To recap: Your base triangles are white. Tier 1 is made up of 3 red parallelograms, and 2 red triangles on each end. Tier two is composed of 4 white parallelograms. Continue repeating tiers one and two, until you reach the desired length. Ending after a tier one (the one with the side triangles). To end the work, you will be creating a set of triangles again. At this point, you should have 33 stitches on your needles; 32 on the left needle (8 for each parallelogram) and 1 on your right needle, leftover from the last triangle. Pick up 6 stitches along the gap and then ssk the first two stitches on the left needle. 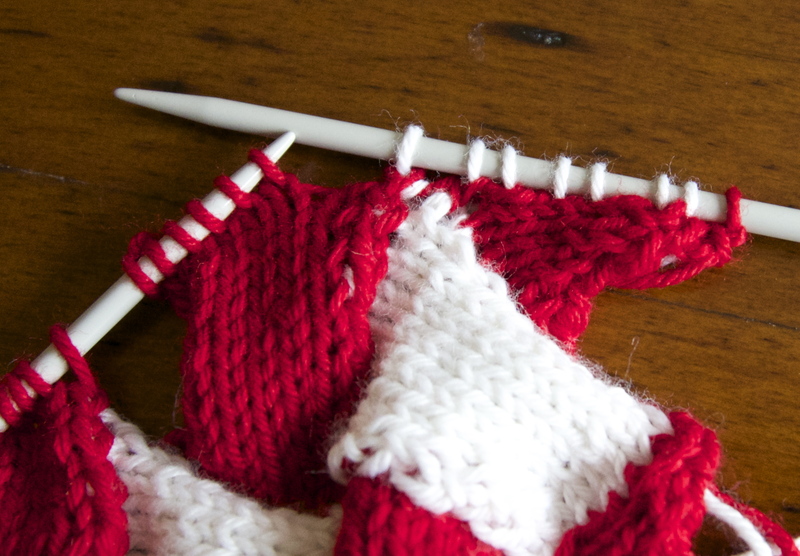 You should now have 1 red and 7 white stitches on your right needle, and 30 red stitches on your left needle. Turn. On the right needle: 1 red stitch (the final triangle in the previous tier), 6 picked up white stitches and 1 white ssk (taken from two red) Note that on the left hand needle only 6 of the 8 parallelogram stitches are left. That marks the end of the triangle. You should now have 1 white stitch on your right needle, and 24 red stitches on your left needle. Repeat steps 1-14 until you have completed the work, and have only one stitch left on your work. Weave in ends. Block. Admire! This entry was posted in Knitting, Photo tutorial and tagged Entrelac, how to, instructions, knit, photo tutorial on June 13, 2013 by lisagono. This week, I started my first summer knitting project, using this soft cotton yarn, Cascade Ultra Pima, that I discovered recently at a yarn shop that I rarely visit. I had to restrain myself from buying enough for at least three projects, since I think it will be perfect for this gorgeous cap sleeve top from Purl Soho, and half the fantastic patterns in the summer issue of Interweave Knits (especially the Stonecutter sweater, and Regatta tee). After an admirable display of restraint, I just bought enough to start the project at the top of my ravelry queue – the very popular Vodka Lemonade cardigan from Baby Cocktails, in electric blue. It’s easy to see why this pattern is so popular! I love the seed stitch and ribbing border on this sweater, and the pattern is constructed using my absolute favourite method: seamless top-down raglan. So far the pattern has been wonderfully clear, and I can’t wait to start wearing this over summer dresses. Most ravelers have made a play on the pattern’s name, and named their projects after the cocktail that corresponds most closely to their colour of their sweater. By that rule, my definitely has to be Blue Curacao. Which brings me to this week’s other events. We still haven’t booked our summer trip! We have two weeks of vacation time at the end of August, and still no consensus on where to go. We’ve toyed with the idea of returning to the Rockies or Newfoundland with our son, or making our long delayed but oft discussed trip to Iceland. Until recently, we hadn’t made any headway narrowing down the list. However, last week, we finally settled on a longer trip to visit relatives, with our son, and a few nights, just the two of us, in Havana. However, as it comes time to book a flight, two things give me pause – all the inherent difficulties of travel in Cuba (outside of the resorts) and hurricane season. 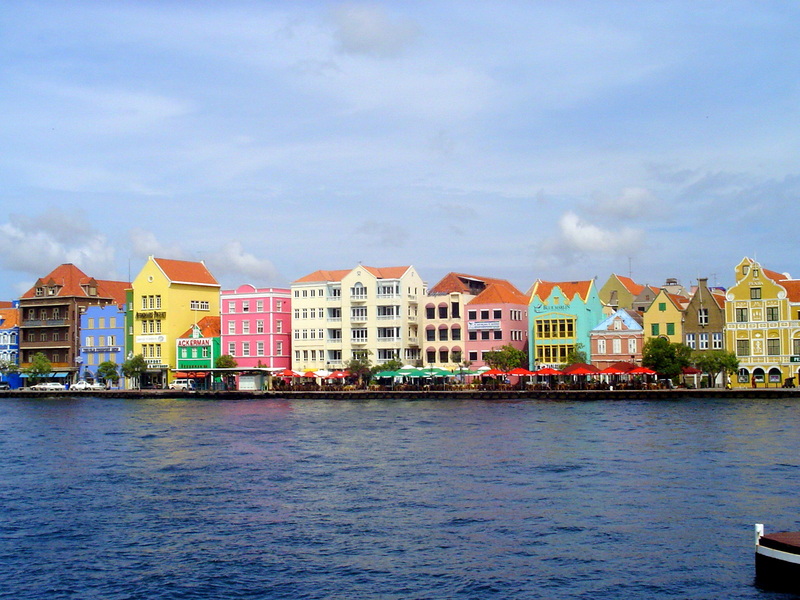 Fortunately, the colour of my cardigan provided me with some inspiration, what about Curacao? A gorgeous historic city centre, world class coral reefs, a beautiful national park and a geographic location outside of the path of most hurricanes. How can this be the first time I’ve thought of this? The negotiations continue with my husband on the side of (cheaper) Havana and me on the side of (easier) Curacao. Either way, it’s fun thing to talk about both great options, as I work on my cardigan. Willemstad, Curcacao. I’d love to take my own picture! This entry was posted in Knitting, Sweaters, Travel and tagged Baby Cocktails, Cascade Ultra Pima, Curacao, knit, Summer knitting, sweater, Vodka Lemonade cardigan on May 30, 2013 by lisagono. My Overby sweater is done, and I sort of like it. I rarely make sweaters for myself, because I’m almost pathologically picky about fit and I find wool really itchy (I know, it’s a strange confession for a knitter!). However, when I saw this pattern, and the new cotton tape yarn it was designed for, I was completely seduced. I love cotton sweaters, and the fit, texture and stretch of this sweater make fit less of an issue. That said, I have mixed feelings about the results. I still love, love, love the texture and silhouette. The actual knitting was as quick and easy as can be, but the yarn presented a few unique challenges. Berocco Karma is a new yarn, with only 48 ravelry projects, so getting tips and help online wasn’t easy. It’s a loosely woven cotton tape, making weaving in ends nearly impossible to do to my satisfaction. On the advice of my LYS, I ended up attaching balls of yarn by sewing the two ends together with a few stitches in matching thread. That didn’t solve to problem of the ends, and there are a couple places where they have worked their way to the surface. I hate, hate, hate seaming, and this sweater is constructed in 4 flat pieces (the absolute worst method of construction if you ask me). This turned out to be the biggest hurdle and source of dissatisfaction with this sweater. My inexperience with set-in shoulders made me reluctant to start messing with the pattern, and now I really regret it. I should have knit as much as possible in the round, or even better used Ann Budd’s Knitter’s Handy Book of Top Down Sweaters to rewrite the pattern as seamless. 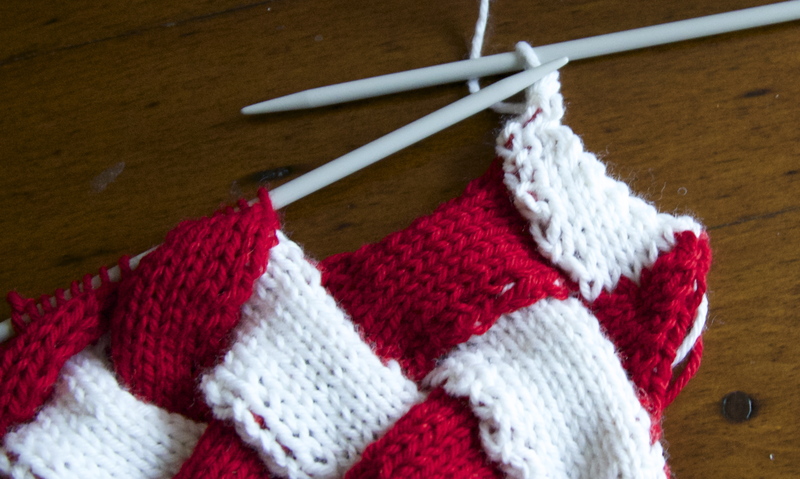 I started blogging, in part, to elevate my knitting skills and push myself to try new things, so I was determined to master seaming and finishing. I scoured youtube, and watched Berroco’s own excellent videos. It was a little too late; they recommended decreasing for the sleeve cap one or two stitches in for the sleeve cap to give yourself a firmer edge to sew into (thanks, guys, but next time put that in the pattern!). I waited until my son was asleep and my husband was safely ensconced in the NHL playoffs to attack. I laid everything out after diligently blocking. However, even with all that care, the seams do not meet my standards. I hate wearing anything that looks amateurish, and these seams seem to have conspired against me. The loose stitches make every misstep glaring, and somehow, I sewed one armpit slightly tighter than the other (not really visible, but still). All that said, I loved this yarn, and the way it feels, I can’t wait to find another really great (seamless) sweater pattern for it. Please, share if you have any ideas! 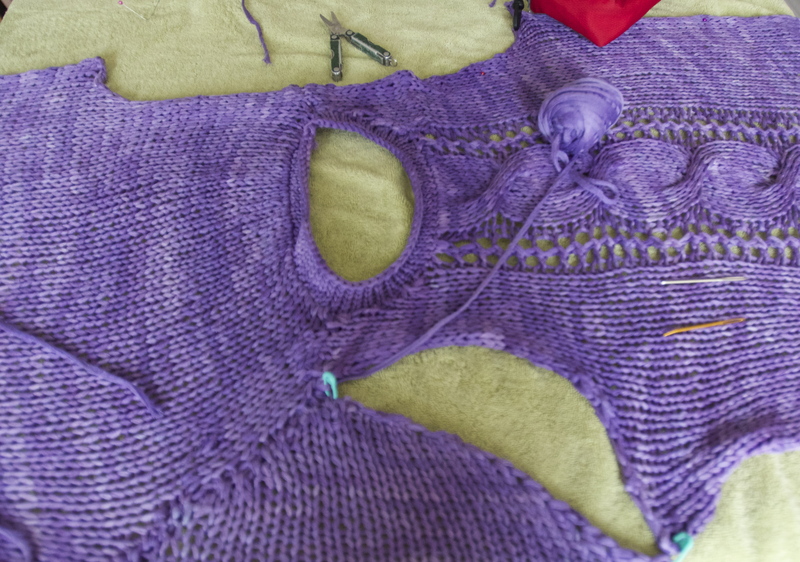 This entry was posted in Knitting, Sweaters, Yarn and tagged Berroco Karma, cables, cotton yarn, finishing, knit, knitting, Overby sweater, seaming, sweater on May 16, 2013 by lisagono. I’ve been knitting on and off, since my grandmother taught me decades ago. Having a son solidified knitting as the only hobby that can really, seriously compete with travel for my money and time. I love to knit sweaters for my two year old son, socks for my husband, and everything else for our ever-expanding extended family. Here, I hope to document our adventures, in travel, and in yarn.